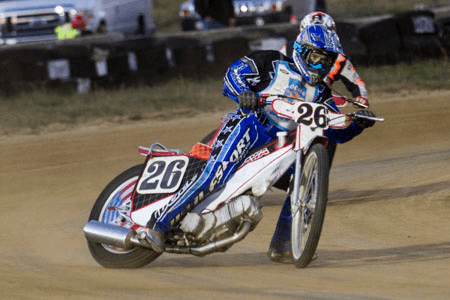 Mid America Motorcycle Speedway - What is Speedway? 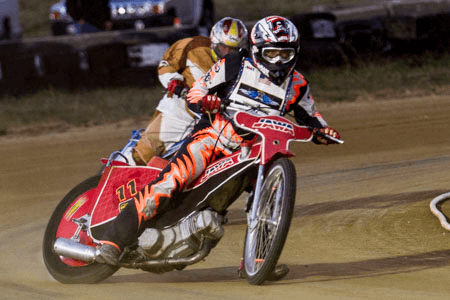 A speedway motorcycle is unlike any other motorcycle that you have ever seen. The motors are 500cc methanol burning four strokes. The bikes weigh in at about 170 pounds and put out somewhere in the neighborhood of 75 horsepower. 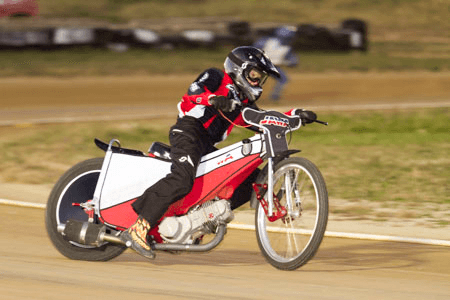 With the light weight and high horsepower a speedway bike is capable of going from 0-60 mph in less than 3 seconds. The bikes are remarkably simple in that they have no transmission, very little front suspension, no rear suspension, no starting mechanism, and no brakes. That's right, no brakes! The rider enters the turn full throttle and throws the machine sideways to get the motorcycle turned, and then aims for the next turn. A speedway "meeting" consists of four heats and a main event. Each rider will ride in four heats, starting each one from a different spot or "gate" on the starting line. The four riders with the most points after four heats go on to the main event. All heats and mains are four laps and the fast guys can run their four laps in less than 50 seconds. A rider cannot touch the tapes before the start. If he does, he goes back to the penalty line. If he breaks the tapes, he gets to watch from the sidelines. If two or more riders go down on the first lap, the race is re-started with the rider causing the re-start going to the penalty line. Should a downed rider be unable to start his machine after two-minutes, he is excluded from the re-start, and headed for the pits.